apartment is well maintained and kept immaculate. We typically rent out to small groups or families sharing with young children/grandparents/friends or another small family. Please note: This is not a party apartment and is located in a quiet house, for that reason we do not overfill or take bookings from large all adult groups. We are Amanda and Julian and we have 2 children Harry and Isabel we live and work in London. We have owned our apartment in Austria for 10 years and now enjoy spending as much time as we can in Maria Alm all seasons still discovering so much of what this area has to offer. Maria Alm is a traditional Austrian village set amongst some of the most stunning scenery in Austria, the people are warm and welcoming and although a very popular ski destination the locals have worked very hard to preserve local customs and traditions which really makes it a very special place to visit. Restaurants/bars have remained inexpensive although all offering a fabulous range of excellent food. Please contact us if you have any questions about MA even if you are not choosing our apartment happy to help you. Having Spent many years holidaying in Austria mainly Filtzmoo's, Alpbach and Kitzbuhel, we decided to buy a property, the big question however being where exactly? After several months of research and visiting numerous ski areas and properties we decided without hesitation on Maria Alm. We wanted a property that we would personally want to rent and return to, with the key factor being its location. Maria Alm is a beautiful village surrounded by stunning mountain scenery, views from our terrace/windows are amongst the best in the village. Located in the centre however, set back from the road leading into the village it is really quiet whilst only minutes away from all the amenities like supermarket, restaurants and most importantly ski lifts/cable car. The apartment house benefits from being in an enviable position. The apartment is shaped in an L shape so really has a very spacious feel to it even with larger groups, there is some privacy (particularly if there are 2 families/extended family sharing). The kitchen lounge area is all open plan which is really beneficial when holidaying with friends. The most amazing discovery for us has been the quiet slopes/lack of queues, compared to large resorts who have many more beds on offer. We now fully appreciate why families we have since met have returned to this area for many years (great snow records). Everything in the apartment is modern and new and so far feedback has been really positive, with many repeat guests returning annually. Take a look at our on line reviews both on this site and also on our website from guests many of whom return each year. Do not hesitate to contact us by telephone or email we will be very happy to tell you more about the apartment and the local area. Modern large bathroom which also has a full size seperate shower and WC. Also en suite which has a full size shower and WC (located off the main bedroom). Towels provided (no extra charge) both with underfloor heating. Notes on accommodation: Children are welcome, the apartment is all on one level with no steps and has underfloor heating throughout. There is a small children's playground belonging to the apartment house (can watch children from front balcony) there are a small selection of board games/DVDs/books for use. The resort of 'maria alm' is a children's paradise with a huge range of organised programmes activities. We are only 200 metres from playground, skateboard park, basketball/football pitch. Internet access new from April 2010. N. B please note this apartment is in a quiet house part residential - for this reason we do accept bookings from all adult party groups. The apartment to date has worked very well with families either two small sharing or one large extended or a regular family who like lots of space. (where possible we maybe able to offer a discount, particularly out of season for small families) enquire direct. Our apartment prices are very fair and comparable to many much smaller properties. Outside: There is a large terrace which leads from the lounge which has a table and chairs and sun loungers with stunning views of the Aberg Mountain and the village of 'Maria Alm' and also there is a large balcony which leads from one of the bedrooms (bunk bedroom) with table and chairs and amazing views of the Hochkonig Mountains. A short walk from the apartment is the amazing heated Lido which has water chutes, cafe, lazy river, playground etc. Also 5/10 mins away by car is stunning lake of Saalfelden which has beach like effect with sand, swimming, watersports, restaurant set with stunning snow capped mountains in background. Utility Room: There is drying room in the basement where you can leave any wet clothing/ski wear to dry. Cleaning / Towels / Linen / Maid service: All Linen and towels are included. Unusually for Austria we do not charge extra for cleaning at the end of stay (apartment will not be cleaned during your stay). We will also provide toilet roll/dishwasher tablets/tea towels etc, for your convenience. Other: There is a basement room where you can keep bikes/skis also a small children's play area outside the building. There is a private undercover car parking space allocated to the apartment and also additional guest parking should you require an extra space. Very good location, close to the village and all facilities. The apartment is very well fitted out, with all you need for a self catered holiday. Would happily go back again and also would recommend it to anybody thinking of going to this stunning part of Austria. This was our 3rd stay at this apartment. We did a lot of research and I don't think you will find a better deal anywhere for a property of this size and quality. We have used this website a dozen times and this property is the best for quality and value. We were 4 adults and 4 children and at no time did we feel cramped in this huge flat. It is spotless and superbly equipped. The apartment is suitable for young and older children, easy stairs to the first floor and a lift if you need it. 2 excellent bathrooms, 3 great bedrooms, all with TV/DVD players are great when you need some space and the lounge/diner is fantastic and a great place to socialise. The kitchen is excellently equipped with enough of everything to cook properly and entertain large numbers of guests. The balcony in the lounge has a fantastic view of town and the mountains. The location is perfect, very close to the ski/hire shop, bakers, restaurants etc. but not noisy at all. The basement has a very handy, secure storage area for your skis etc. We were able to drop our luggage there in the morning of our arrival before going skiing which was a great help. Amanda provides an excellent service. Booking was smooth and Amanda really does respond immediately to any enquires you have. We had young kids so weren't really hitting the bars but there is plenty of night life and good restaurants and hotels if you want to eat out. All within easy walking distance (2- 5 minutes). I have no hesitation recommending this apartment. Do your homework and you will see nothing comes close on price. You won't be disappointed, this apartment "does what it says on the tin" with great service thrown in. It is like a home from home for us. Its warm, cosy and so easy to live in. Thanks Amanda and Julian for another fantastic stay! This was the second time we stayed in this lovely apartment and on this occasion we brought along all four of our teenage kids as we loved it so much the first time. There's a number of reasons we returned but here's our top three. LOCATION. (village centre and walking distance to supermarkets, restaurants, pool/sports area, various lifts, hiking/biking areas and loads more). The INTERNAL LAYOUT really is very impressive especially when you have four huge teenagers - there was ample room for all including 2 sun balconies. THE OWNERS (Amanda and Julian) are also very helpful and quick to respond via email which is great especially when you've got a quick question. They also have loads of local knowledge of what to see and do which really is useful when you want to book various activities as we did (canyoning, white water rafting, high ropes, mountain biking, swimming, golf, trail running, hiking etc etc - the list goes on!). I would highly recommend this apartment and we will soon be booking for a third time! We have stayed at this apartment twice and would have stayed a third time but our dates clash with an existing booking. On our last week long skiing trip we were two families of 4 adults and 4 children. The apartment is very large and we never felt cramped at any time. The bedrooms are large with comfortable beds and the two bathrooms are also large, have excellent showers and one has a great bath for the kids. The lounge/kitchen is great. We used one half of the folding table so all 8 of us could sit around the kitchen dinning table together. We have stayed at a number of owners direct properties and this has to be the best equipped we have visited. You can cook anything as the kitchen is very well equipped with plenty of cutlery, cooking utensils and pots, dishwasher, coffee maker, freezer, microwave etc. The basement lockup downstairs is very convenient for your skis and boots etc., as is the car port and additional guest parking next to the apartment. We had some lovely evenings in the lounge which has a great view from the terrace of the rest of town. The apartment is very conveniently located. the ski shop where you can rent ski equipment and book ski school and lift passes is 1 minute's walk away, the Billa supermarket which has everything you need is only 2 mins walk. You can walk to the ski lift in town or drive 2 mins to the local cable car which is what we did each day. You can always get parked even in peak times. This is a great apartment, excellent value and very conveniently located in a very picturesque town. It is furnished to a high standard right down to the beds, linen and towels etc. You wont need to bring anything (there are even dishwashing tabs and cleaning products at the flat). I would thoroughly recommend this apartment to anyone. Amanda has been extremely helpful, and prompt in all correspondence so you will be well looked after. Amanda and Julian thanks for a brilliant two holidays at your lovely flat. We will be back! We have just returned from a wonderful weeks skiing in Maria Alm staying in this lovely apartment. The apartment is very well equipped as well as being very child friendly. It is close to all the amenities of the town. The ski bus stops 50m down the road, but it is only a 5min walk to the bottom closest lift if you're too keen to wait for the bus. The communications with the owners were excellent - quick responses and friendly. Would recommend to anyone looking to holiday in this beautiful area. Handily placed for the centre of Maria Alm and the bus for the ski slopes. The apartment is very spacious, warm and we cannot wait to return. 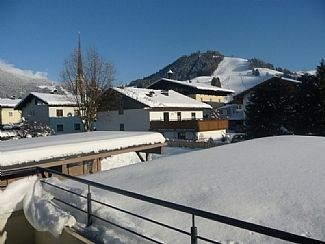 our property name is 'Apartment Maria Alm' Nearest airport Salzburg 1 hour (approx). There is an excellent bus service from the airport to the region, alternatively car hire is an option although not a necessity for skiing holidays as there are bus/train links. Summer: car hire is an advantage in order to explore the surrounding areas, however again it is not a necessity as there is a good bus service which links major towns attractions. Nearest airport is - Salzburg (1 hour approx). Nearest Town - Saalfelden (4km). Zell am See - 15km (approx). Leogang/Saalbach Hinterglem - 10km (approx). The apartment is ideally situated for the local bars and restaurants, apres ski (minutes away). The village has great facilities with bank, post office and 2 ATMs. There is a nightclub in the village centre (winter only) and many themed events run throughout the year. In summer there is a real cafe culture in the village square with live music/dancing held outside weekly. There are 2 excellent speaking ski schools run from the village. Maria Alm offers horse drawn sleigh rides, tobogganing, floodlit skiing, cross country skiing, weekly ski show and much more. In the summer this area is stunning with a huge modern outdoor lido with chutes and slides, basketball, tennis, skateboarding, walking, lakes, mountain biking, mini golf and of course the Urslautal Golf course less than half a mile away. Only 2 hours from Italy this region enjoys great summers (temperatures up to 30 degrees). Booking Notes: All payments are made in EUROS (prices quoted are in pounds for the purpose of comparison only) a non-refundable deposit of 300 euros will be required to secure your reservation, a receipt will be sent straight away when this is received. Balance required 6-8 weeks prior to travel, please note the standard Austrian tourist tax of 1.10 per person (over 15years) per night will be added to your balance. At this stage a receipt and all the details you will need for your holiday i.e key collection etc will be sent to you. For full booking conditions please visit our website www.apartmentmariaalm.com We have rented our apartment out through owners direct for at least 8 years and independently without incident. In fact 80% plus of our guests return annually. Changeover Day: Changeover day is Saturday (there may be some flexibility with this out of high season). Check in after 3pm - check out 10.00am. Notes on prices: (EURO) Prices are for the whole property per week are in Euros for up to 8 persons (inc children) All inclusive of cleaning linen and towels. The only extra fee is the standard Austrian tourist tax 1.10 euro pppn, which will be added to the final invoice, (tax form to be completed). Discount for small groups low season please enquire direct. N.B As a rule we do not take bookings from large all adult party groups, as this property is in a quiet house, small adult groups 4/5 accepted with reassurance. We may be able to offer a discount for very small groups low season. To convert the quoted pound prices to euros please convert by using the option to the right of the screen. Please note the euro price are absolutely guaranteed throughout the booking however, depending on the exchange rate at the time of balance payment, the pound price may vary as this is obviously dependant on exchange rates.